As a lad who’s lived in Kent for most of his life, I get a nosebleed living up near the MCN offices in Peterborough, so my week on the road sleeping in the back of the van visiting Oulton Park for a trackday and racing at Pembrey felt like a long way from home. My first stop was a brilliantly run mid-week Focussed Events trackday. The riding standard was excellent and there were very few incidents. It was one of the most enjoyable trackdays I’ve ever done. The sun was out (for a change), everyone was friendly and if you’re not turned on by riding the Cheshire track’s glorious swoops and curves, you need to check your pulse. It’s like a mini Nurburgring and easily one of the best tracks I’ve ridden on. I didn’t get the fork bottoming-out problems I had at Brands on my BMW Park Lane S1000R at Oulton (or anywhere else), so it must be a problem unique to Brands. The third round of the Bemsee Team Respro Premier 1000 championship. It’s fair to say that Pembrey, south Wales isn’t as shiny or lovely as Oulton – it’s pretty basic, takes ages to get there and there’s no shelter from the cold, wind and rain we had over the weekend. But it’s got two things going for it: an electric hand towel machine in the toilets and the track itself is fast, fun and grippy – if a little flat and featureless. Unfortunately most of the usual suspects didn’t bother turning up, so my main challenger was fast local Paul Shook on a ZX-10R (see pic). I managed to score pole position, won two races and finished second to Paul in the other one. I think I could’ve actually won that one too, but I waited until the end of the race to get past, led the final lap, pulled out a gap, but the race was red-flagged after an incident and I got second position on count-back. That’ll teach me for not overtaking earlier when I could. There was a fourth race, but since we only got points for three of the four races I chose to sit it out and save the bike. Now it’s warmer the Dunlop Ntech slicks I’m using are giving amazing durability. I used a single set (soft front, med/hard rear) of tyres for the qualifying and a race at the previous round at Brands, all day at Oulton and then the whole of Friday practice at Pembrey – impressive since the Welsh track is really abrasive. They still looked good after all that and were still fast. I might even use them again for a trackday. Changing to new tyres gives you that last little bit of time you need to set a good time, but if you were only doing trackdays I reckon one set would last five or six events. I’ve really been getting my head around the MotoGP-grade datalogger fitted on my bike, produced by 2D. I can see where I’m not accelerating or braking hard enough and it’s good for figuring out my gearing and what gear to be in. Most of all it’s just the ultimate toy. You could spend hours going over all 32 channels of the day’s data. 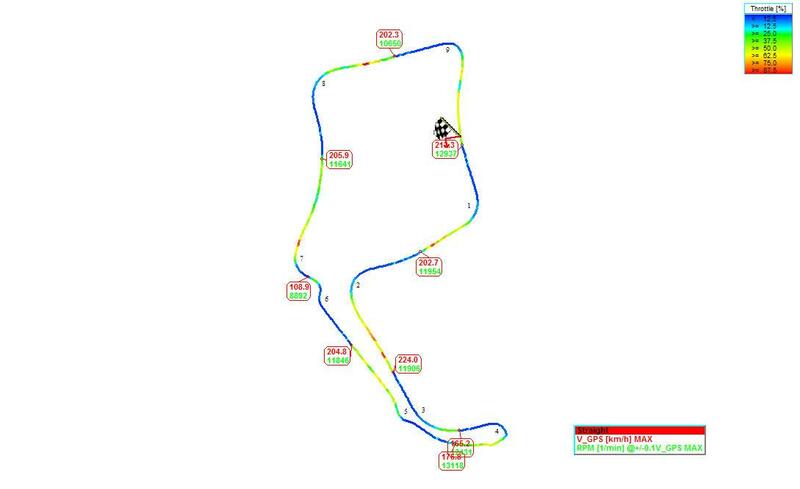 Here’s one of the standard track maps for Oulton and Pembrey you can print out to bore people with. 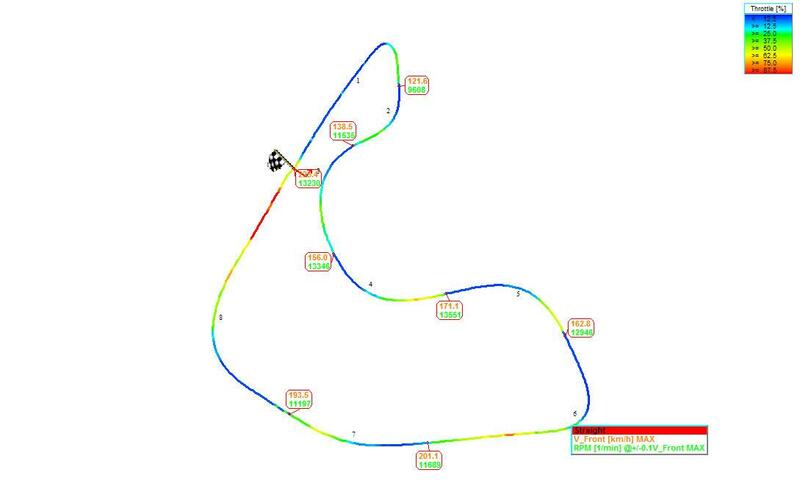 This one shows speed, RPM and throttle position on various points around the track. There are also maps to show everything from wheelspin, traction control intervention, brake pressure, gear position…the list goes on. Looking at the data, it’s interesting how little you can actually get to full throttle on the Beemer, which shows that no matter how much power you’ve got, if you can’t get the gas fully open it’s all for nothing. When you’re racing you don’t actually get to see much action on-track, but I couldn’t ignore one very special piece of riding. Alan Russell of A&R Racing services the Bemsee paddock with a tyre and spares service (along with Rod Harwin Racing). Alan decided to dust down his leathers and Honda RVF400 to enter the EDIasia Formula 400 races. Despite not having ridden for a year and changing hundreds of tyres in between races, he went out and scored two thirds, a second and a win! Alan was set up opposite me and one minute he’d be in his overalls changing tyres and the next in leathers battling on-track. Impressive is not the word. Well done, Alan. My next run out on my beautiful Beemer is at Snetterton 300 on Thursday May 9 at another Focussed Events day with some Park Lane customers. 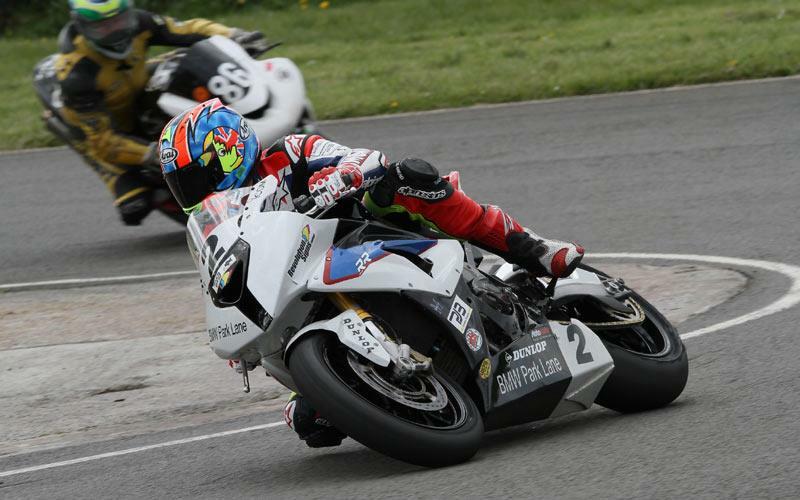 Then it’s the next round of the championship at Oulton on the Jubilee Bank Holiday on 4th and 5th June. It’ll be weird racing on a Monday and Tuesday, but I can’t wait to visit that epic track again. I’ll also be doing some instructing at the Ron Haslam race school over the summer.